The wolf stood under the trees, several yards from the fence. His eyes were fixed on the stone statues. He growled and took a few slow steps back. Then he sprang forward and ran full speed toward the gate. His upper lip drew back, showing sharp, long canines. He jumped over the spikes of the fence, his belly inches away from the pointed iron finials. The wolf landed on the other side and left large paw prints on the freshly mowed grass. He lost his balance but regained it momentarily. He heard her footsteps even before he heard her voice. The wolf whimpered and trotted forward to meet her. Without slowing down, she threw herself onto him. Her hands grabbed his thick fur. His body was massive, and Jasmira looked like a child hugging an uncommonly large dog. The air around them pulsed and shivered. Jatred shifted into his human form and fell onto his back. Jasmira sprawled on top of him. Holding his face in her hands, she kissed him. His face broke into a broad smile. Add Forged by Greed to your to-read list on Goodreads. Angela is a Young Adult and Adult fiction writer. She completed her first YA paranormal romance novel, Forged by Greed, which is scheduled for publication on September 20, 2012. This is the first book in The Forged Series. Angela writes in multiple genres, including paranormal, fantasy, urban fiction, sci-fi, and short stories. She is a member of Society of Children’s Book Writers and Illustrators, Western Washington Chapter, and several authors’ and readers’ networking groups on Linkedin and Goodreads. Forged by Greed will be released on September 20, 2012. The second book in the series (untitled) is scheduled for publication in summer 2013. Visit Angela on her website and on her Author Goodreads page to read more excerpts from Forged by Greed and to learn about upcoming giveaways and other events. 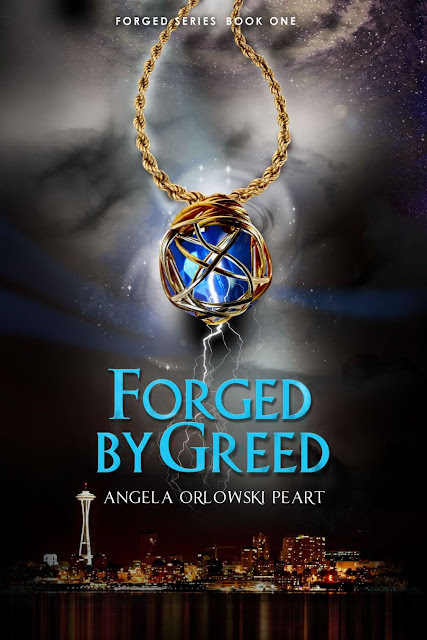 Add Forged by Greed to your to-read list on Goodreads and check back on September 20th for the buy links and the book blog tours information. Is that book cover gorgeous or what? What are your favorite book covers?